A few new details and photos have been released of the Infiniti FX Sebastian Vettel high-performance crossover concept ahead of Frankfurt. 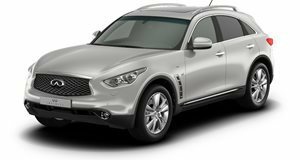 Early last week some details were revealed regarding the Infiniti FX Formula One World Champion Sebastian Vettel was developing with the Japanese automaker. Set to debut next week at the Frankfurt Auto Show, Infiniti has released additional photos of what they call the "perfect high-performance Crossover." The FX Sebastian Vettel concept, in comparison to the standard FX, was developed on the Autobahn and will be lighter, more aerodynamic, and faster with a claimed top speed of 186mph. It&apos;s based on the V8-powered FX50 S Premium, but comes with a modified engine, suspension, and body. Several key aerodynamic elements have also been added including a new front spoiler, a tailgate mounted wing and a rear diffuser which integrates the dual exhaust system and a third braking light. The body has been finished in Moonlight White pearl metallic paint along with silver &apos;Vettel&apos; badging and carbon fiber wing mirrors and sills. Infiniti will be unveiling the FX50 Vettel performance concept in full next week at Frankfurt.